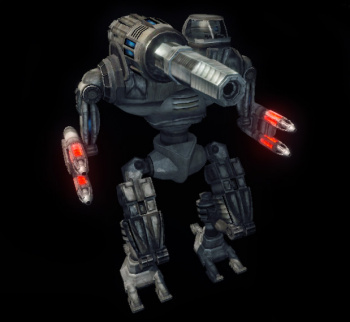 The Hollander II is an Inner Sphere Medium Mech well known for its powerful weaponry and gangly appearance. The Hollander II has relatively light Armor for a Medium Mech, and is not particularly speedy or maneuverable; it makes up for this by mounting some of the most damaging weaponry in MWLL. Hollander IIs tend to stick to the same basic design: one large, powerful weapon mounted on the Right Torso, and smaller, weaker weapons mounted on the Left and Right Arms. The Hollander II does have a couple of glaring weaknesses: both the Cockpit and its main weapon are very visible atop the Center Torso, making it fairly easy to either kill the Pilot or disable the weapon. The Hollander's spotlight is mounted directly above the cockpit. Turning on the spotlight can partially blind the pilot due to glare and the light reflecting off of fog. One of the obvious methods for defeating this Mech is to destroy the right torso of the Mech, thus removing the vast majority of this Mech's firepower. 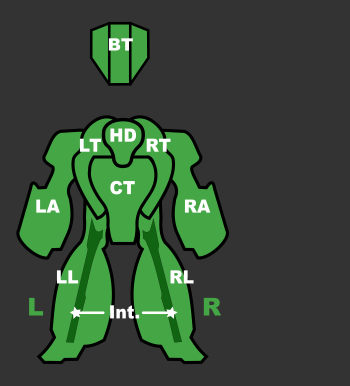 Additionally, one in combat with this Mech may choose to destroy the Left Torso. Although this section does not mount weaponry to remove, it is less armored, and therefore easier to blow away. The Prime variant mounts 1 Gauss as its main weapon, and supports that with 2 ERMBLs, giving it a respectable long-range punch. It lacks any close-range firepower to deter Battle Armor and brawling Light Mechs so a prudent Mechwarrior should try to keep his foes at long range. Care must be taken to protect both the Gauss and Cockpit, as they are both very vulnerable. However, because the Gauss is positioned on the highest point of the Mech, it allows the majority of the Mech to remain in cover when poptarting which the Prime excels at due to its improved jump jets. Furthermore, each gauss shot can be carefully placed with pinpoint accuracy using the Prime's enhanced optics. The Hollander II A mounts a single HGauss as its main weapon, and supports this with 4 SBLs and a MASC system. This gives the A variant absolutely fearsome firepower at close to medium range, and allows it to close at unexpectedly quick speeds. This is balanced with low ammo capacity and a long refire rate for the HGauss, limiting its effective time in the field. Extra care must be given to protecting the HGauss, as that is this variant's primary means of defending itself. This variant is extremely susceptible to spontaneously exploding when the Gauss Rifle is destroyed, due to overloading causing additional damage to neighbor sections. The A also is the only Hollander that does not have jump jets which gives it far less mobility than its cousins. The B variant is a pure brawler. Its massive UAC20 is capable of dealing heavy damage to targets up to 350m away while its 4 small pulse lasers are effective to 250m. The B variant is best used as a brawler, quickly jumping into battle with its improved jump jets, and dealing high DPS with the UAC20 supported by its pulse lasers. An extra 2 free tons allows it to remain in combat for a long time. Alas only having 2 single heat sinks causes mechwarriors to struggle with the B's combined weapon and jump jet heat output. Equipped with only close-ranged weaponry means that at range, the Hollander II B is defenseless. Its large autocannon sitting on its right shoulder is also relatively easy to hit, so Mechwarriors should try torso twisting away from enemies to distribute damage. Thunder Bolt Machine - Are this variants main punch. The odd Thunderbolt are a product of the Solaris VII arena circus - they are useful at any range - from Zero to 750 meters Lock On or dumb fired out to 6000m. This comes at a cost - they are less manoeuvrable than other missiles, and move slower too. One TBolt15 inflicting 980.66 of damage and 326.89 secondary not to mention the disruptive screen shake your enemy will feel. Followed up by 2x TBolt5 chain fired will keep your foe off balance while breaking their armor down. 5 HS will keep things cool while the added 3 free tons allow you field stay to be extended. EOptics and iJJ provide for selective targeting of your foe. Rock'um until they drop. The D variant is an extreme long range sniper. Its light gauss hits targets up to 1250m away while its quad AC2s reach out to 1200m. Mechwarriors piloting the D should stay at long range, liberally using its enhanced optics and BAP to find distant targets to quickly deal combined gauss and autocannon damage to mechs that can't retaliate. Additionally, employing poptarting tactics allows the D to reduce its exposure to enemy sniper counter-fire. 2 free tons of ammo allows it to spend significant time in combat before having to return to base for reloads. Its greatest weakness is enemy mechs that manage to close the distance as the D variant lacks any backup weaponry. The Hollander II E variant mounts the largest shotgun autocannon on its right shoulder - the LBX20. Dealing a massive burst of autocannon pellets accurately up to 450m, the E should be taken seriously at close- to medium ranges. Furthermore, it carries 4 LBX2s which function as very long range harassing guns as well as great anti-aircraft deterrents. One free ton of ammo keeps the LBX20 firing a decent 24 shots before having to return to base to reload. BAP and eoptics allow the E to find and antagonize distant targets with accuracy. Extra LBX damage caused to tanks and ASFs makes this variant good early-mid game counter, should your opponent decides to spam them. Mounting a massive AC20, dual SRM2 and dual flamers makes the F variant a multi-purpose brawler able to deal with mechs as well as battle armor with confidence. Mechwarriors should close quickly to knife fighting range using its MASC to run into battle at 120 KPH, dealing massive combined screen shake with its autocannon and short range missiles while blinding and overheating the enemy with its flamers. Caught outside of this kill-zone, this variant falters completely as its armor is insufficient to take much punishment and has no long range weaponry. 1 ton of extra ammo gives it a decent amount of time to remain engaged in battle. Essentially a poor man's Bushwacker Prime, this Hollander carries an HVAC10 in the right torso mount, with two ERMBLs in the arms for backup. Its ranged firepower is fairly lackluster compared to many other 'Mechs in its price category; the variant's main saving grace is its GECM and improved Jump Jets, allowing this Hollander to sit high up on a hill and empty its generous ammo bins of 3 extra tons of ammo into any hostiles in the vicinity. The closest thing to the Hollander II in Battletech is the Hollander model BZK-F5, which carries a Gauss Rifle, a single Medium Laser, and a Streak SRM 2. There is also no mention of Jump Jets. The F5 variant, called the Hollander II, is a variant of the Hollander that looks to alleviate the 'Mech's problems by building it on a chassis ten tons heavier than the original, pushing it into the medium weight class. First built in 3058. This page was last edited on 31 January 2019, at 00:42.